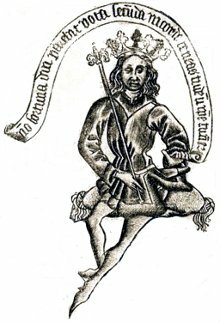 The Master of the Banderoles - so-called because of the banderoles (speech banners) present in many of his prints - originated in the North Netherlands during the mid-fifteenth century and lived in the east of the Netherlands between Zwolle and Bocholt ca. 1462-1500. He (or she) was one of the earliest professional printmakers. Most of his output consisted of devotional and decorative images for the emerging market for prints which would have been pasted onto boards or into books. He tended to copy subjects from other sources whilst building up a composition, or reuse his own motifs, rather than create original works. Working almost within living memory of the first arrival of playing cards into Europe, the Master of the Banderoles set of playing cards provide a rare glimpse into their early development. Some of the Master's work was based on Italian models, so it is possible that he was influenced by or had visited Italy. These eight cards appear to be from an Italian (or Spanish)-suited pack of at least 48 cards, although no Aces or court cards are present in the fragment. The cards have been engraved in sequential order and are separated by a single line. Above: an uncut sheet of eight playing cards probably the work of the Master of the Banderoles, an artist who is supposed to have worked on the Lower Rhine about 1470. The designs suggest Italian inspiration. Height of sheet: 192 millimetres; Width: 270 millimetres. ©The Trustees of the British Museum. All rights reserved. 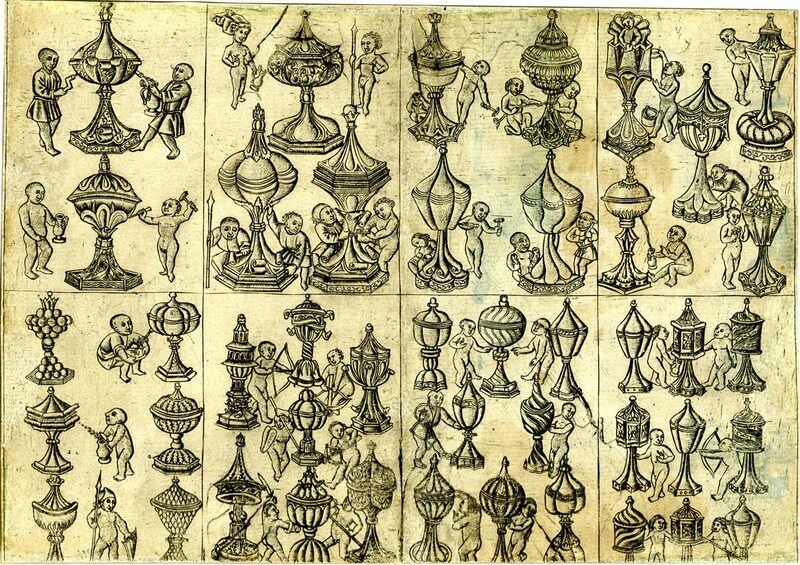 The Master of the Banderoles produced religious and devotional images as well as subjects such as grotesque alphabets and these playing cards. He worked in the new medium of engraving which required draughtsmanship and technical ability for copying the works of existing masters. The cross-over between religious and profane images is evident in the cup suit symbols which are in fact ciboria, cups for holding hosts from the Christian Eucharist and presumably sacred, similar to the chalices used for wine. The Master of the Banderoles seems to be very familiar with their designs. They were usually made of precious metal, or plated with silver, and possibly decorated with engraving. Ciboria were sometimes kept at homes to be handy for the Last Rites where needed. The impish little figures - putti - cavorting amongst the ciboria add a slightly irreverent sense of fun and playfulness to the playing cards, consistent with their use as a recreational game. Cherubs and Putti, which started reappearing in medieval art during the 15th century, were distinct. Cherubs were Angels and thus close to God. Putti were associated with Eros/Cupid and profane love and used as decorative art on buildings, frontispieces and illuminated capital letters. The Master of the Banderoles entertainingly merges spiritual and secular themes in his pack of playing cards by placing putti amongst the ciboria. 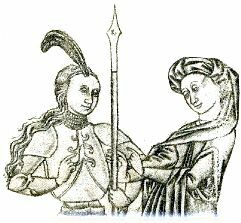 Right: Ace of Batons and Six of Cups from the pack of cards by the South German Engraver showing children cavorting amongst the pip symbols, late 15th century. Left: Aces of Cups & Coins from a Gothic Spanish-suited pack produced in Spain, late 15th / early 16th century decorated with small children playing around the suit symbols. 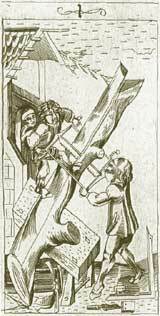 ← In addition, there is another Gothic Spanish-suited pack with naked children gamboling in the numeral cards, produced by woodcuts rather than engraving, believed to have been made in Spain around the same time. Acknowledgements: thanks to Samten de Wet for kind assistance with research. See also: Master of the Playing Cards • Early German Engraved Cards • Master P.W. 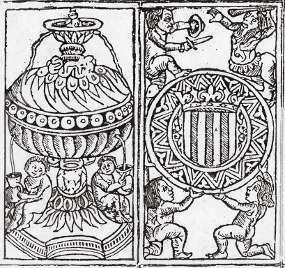 Circular Playing Cards • Gothic Spanish-suited Cards • Tarocchi di Mantegna • Book of Trades, 1588 • History of Playing Cards • Tarot • Design of Playing Cards • Rotxotxo Workshop Inventories, Barcelona.